iconsportscards has no other items for sale. 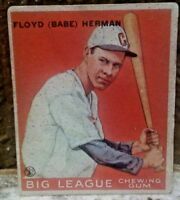 1935 Wiate Hoyt/ Waner/ Bush GOUDEY GUM 4 IN 1 BASEBALL CARD #3C PSA 5!! 1933 Goudey BB #123 Jack Russell Washington Senators SGC 50 VG-EX 4 !!! $0.00 shipping for each additional eligible item you buy from iconsportscards. Customer satisfaction is a priority of mine: your item will be packaged carefully and securely, and shipped promptly. Best offers are welcome on many of my cards, and I combine shipping at no extra charge for any additional items purchased.